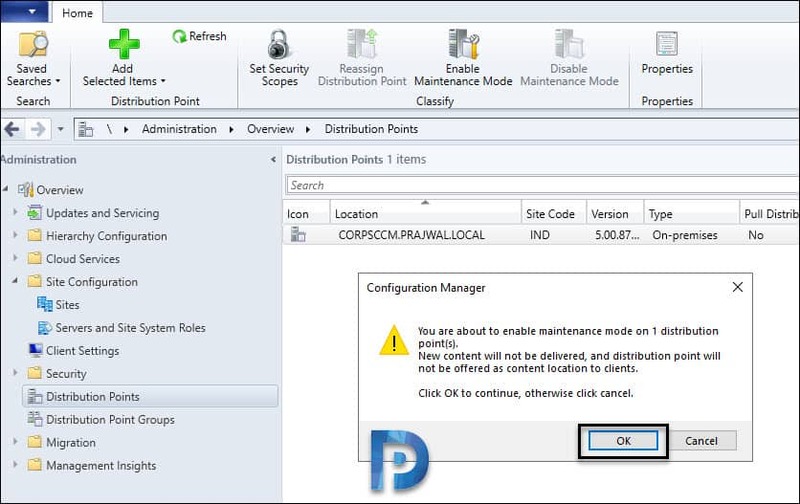 Distribution point maintenance mode is an exciting feature available in SCCM 1902. 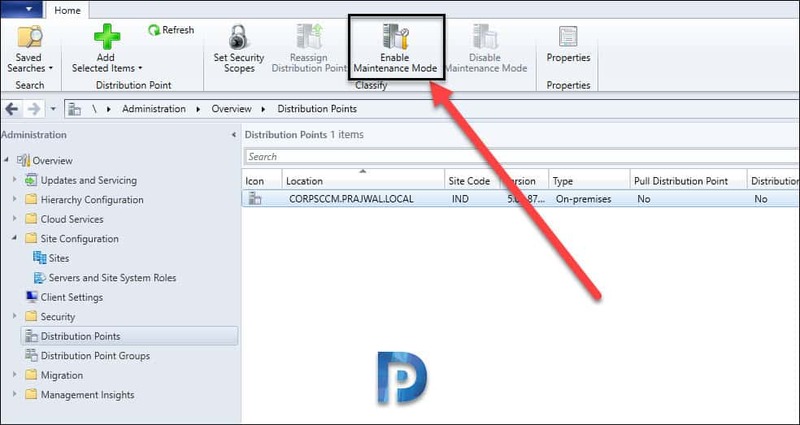 You can now set a distribution point in maintenance mode which offers many advantages. You can enable DP maintenance mode when you’re installing software updates, or making hardware changes to the server. This feature was first seen in SCCM technical preview 1901. I am so excited to see this feature baked into current branch version 1902. Thanks to MS product team for implementing this feature. Thank you everyone for voting for my idea. We will see some scenarios where the DP maintenance mode helps. 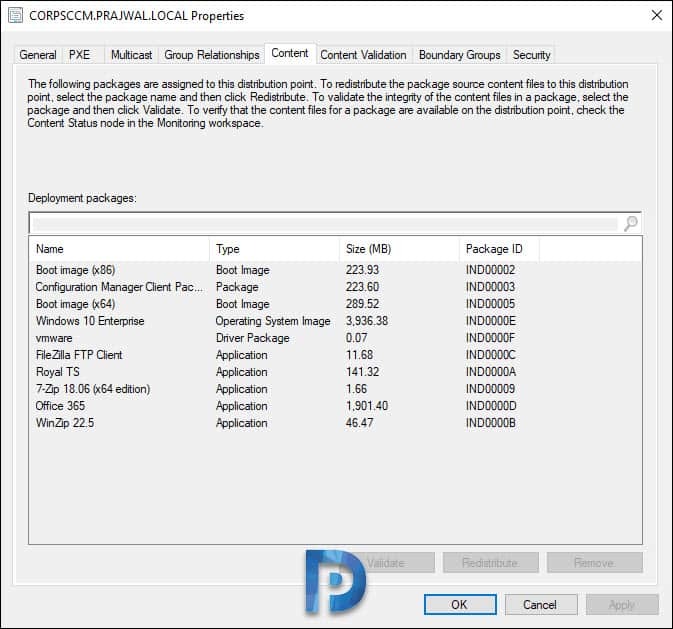 Check out my Configuration Manager 1902 upgrade guide. Let’s look at some situations where distribution point maintenance mode is useful. Suppose that the distribution point server is in transit from the location where it was installed to the site where it is to be used in production. You know that the distribution point server will be connected to network soon. When you enable maintenance mode, site doesn’t distribute the content to that distribution point. In addition to that Management points don’t return the location of this distribution point to clients. I work in a company that has got around 60 distribution points across globe. Monitoring the distribution point servers is a big task. What happens if the distribution point server goes down and content is being distributed from primary distribution point. You will see repeated errors in distmgr.log and PkgXferMgr.log files. There is no way to stop those error messages unless you uninstall distribution point role. In such situation, you can enable maintenance mode on distribution point. 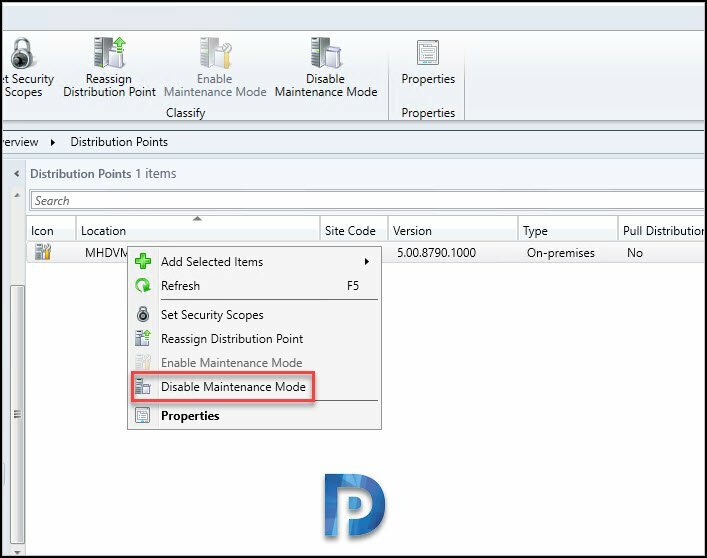 So what exactly does enabling maintenance mode on distribution point do ?. 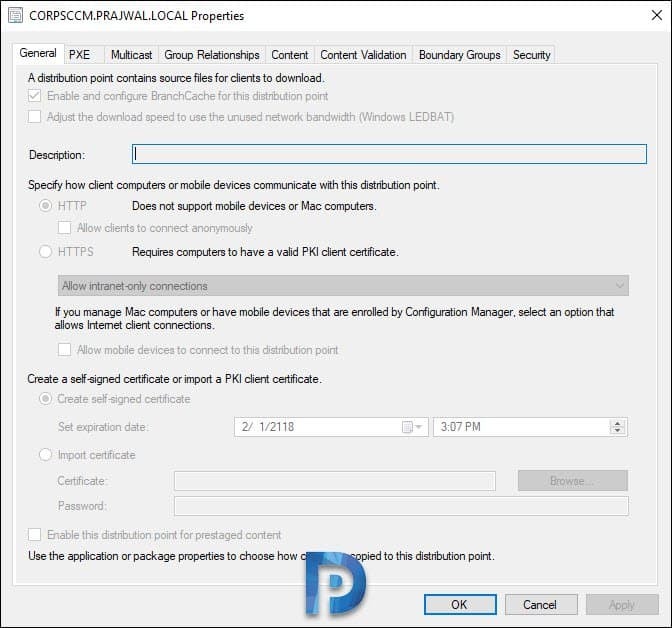 While the SCCM distribution point is in maintenance mode, it has the following behaviors. The site doesn’t distribute any content to it. Management points don’t return the location of this distribution point to clients. When you update the site, a distribution point in maintenance mode still updates. The distribution point properties are read-only. 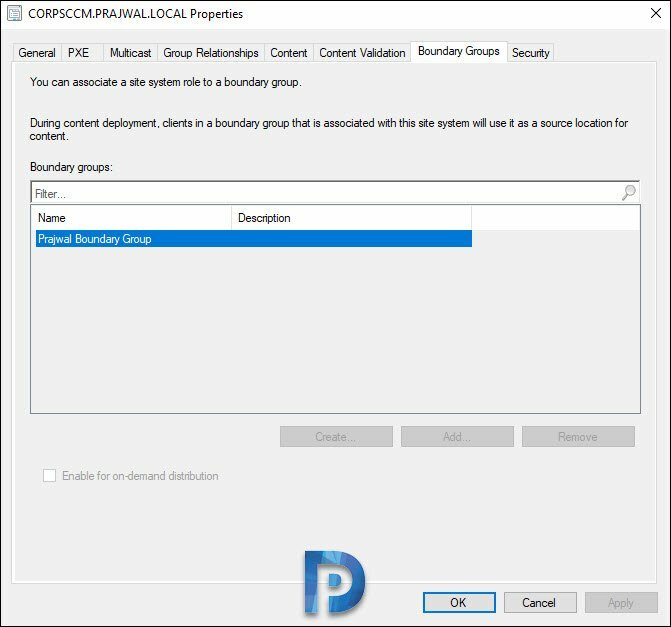 For example, you can’t change the certificate or add boundary groups. I have added some screenshots, check them in next section. Any scheduled task, like content validation, still runs on the same schedule. 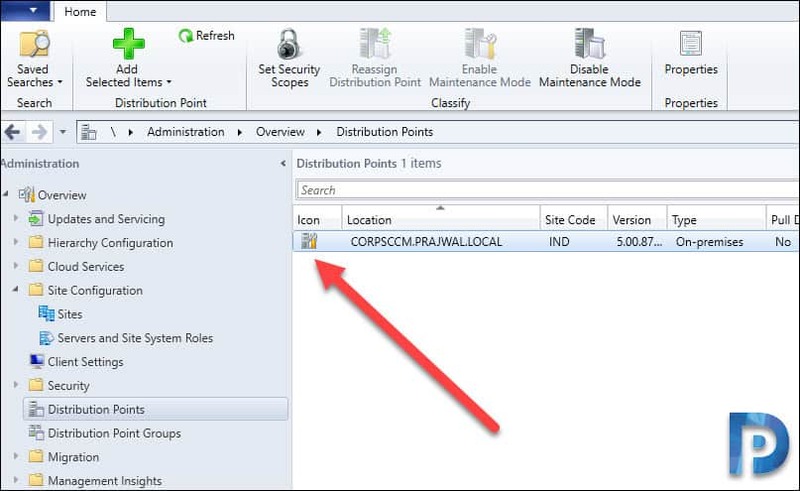 Note – Distribution point maintenance mode is a feature available in SCCM 1902. You must first upgrade your Configuration Manager current branch to version 1902 to use this feature. I am still testing the DP maintenance mode. I will keep updating the post when i find discover new things about maintenance mode. If you see any info missing about maintenance mode, do write in comments section. Navigate to Administration > Overview > Distribution Points. Select the Distribution Point. On the top ribbon, click Enable Maintenance Mode. You can also right-click a distribution point and enable maintenance mode. A message box pops up. You are about to enable maintenance mode on 1 distribution point(s). New content will not be delivered, and distribution point will not be offered as content location as to clients. Click OK to continue, otherwise click Cancel. To enable maintenance mode, click OK.
Notice the icon changes when you enable maintenance mode. That icon represents that the distribution point is in maintenance mode. We will now look at distribution point properties after you enable maintenance mode. After enabling maintenance mode, right click distribution point and click Properties. On the General tab, you see almost all the options are greyed out. You can’t modify anything here. Next click PXE tab, notice all options greyed out here. Click the Content tab. Note that you can neither Validate, Redistribute nor Remove any content when you put a distribution point in maintenance mode. The boundary groups options are also greyed out. How do you verify who enabled or disabled maintenance mode on a distribution point ?. And are there any SCCM log files that record this activity ?. 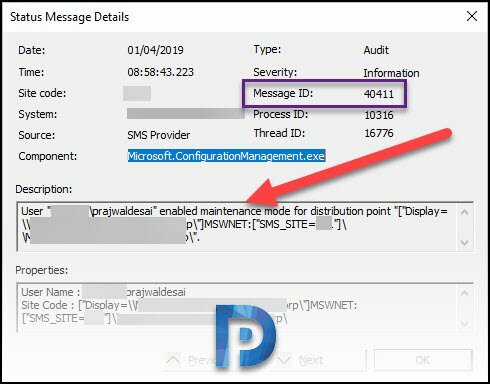 Log Files – If you monitor distmgr.log file you will find the below line which confirms the DP is in maintenance mode. The packages or content that are in queue will be sent to distribution point once you disable DP maintenance mode. 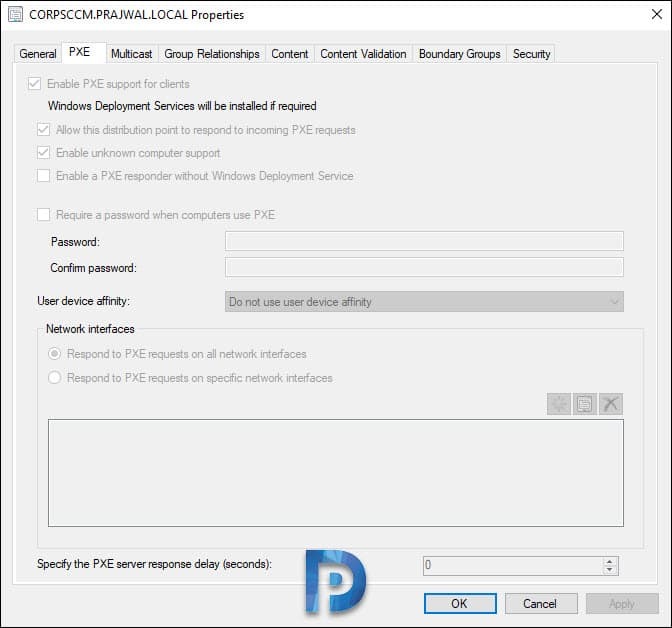 Skipping configuration change for the distribution point role “DP Server” since it’s in maintenance mode. Status Message Queries – If i am correct, the SCCM log files won’t record who enabled or disabled maintenance mode on a DP. The status message queries will actually tell who enabled or disabled the maintenance mode. The status message with following details will help you to find who enabled/disabled maintenance mode. Description – User “prajwaldesai” enabled maintenance mode for distribution point. If you want to disable the maintenance mode and get the DP to work, the steps are simple. Select the distribution point, right click and click Disable Maintenance Mode. The icon changes back to what it was earlier. Look for status message with message ID = 40412. That should tell you who disabled maintenance mode on distribution point. Good article Prajwal, thank you for sharing. After disabling maintenance mode, do we need to restart the server ?? No restart is not required.